Chinese Hot Pot: Chinese Hot pot (also known as steamboat), refers to several East Asian varieties of stew, consisting of a simmering metal pot of stock at the center of the dining table. While the hot pot is kept simmering, ingredients are placed into the pot and are cooked at the table. 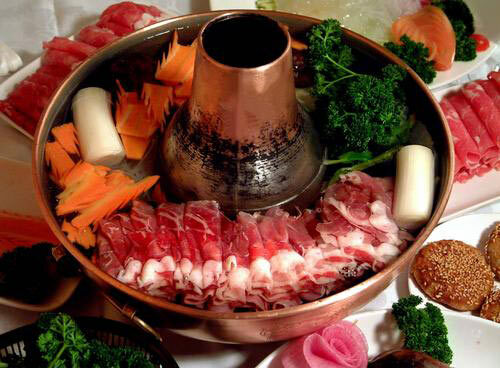 Typical hot pot dishes include thinly sliced meat, leaf vegetables, mushrooms, wontons, egg dumplings, and seafood. Vegetables, fish and meat should be fresh. The cooked food is usually eaten with a dipping sauce. A single-burner tabletop stove powered by butane is normally used to serve the boiling pot. Make sure to choose a portable single- burner that can adjust the output. Although any stainless steel pot can be used to serve the hot pot, I normally use a special pot with a divider in the middle so I can serve half spicy & half non-spicy. Make the base stock by combining beef or pork bones or chicken skeleton with water, ginger, scallion, bay leaves. Broil and simmer for 3 hours. Note: The base stock can be made in advance. Chop the Sichuan Spicy Bean Paste, soaked dry chilli, ginger, garlic, and black bean paste. Cook in low heat for 10 minutes. Add the rest of the ingredients (dry spices, cooking wine and sugar) to the paste. Continue to cook in low heat for another 30 minutes. This is the spicy paste for the Chinese hot pot. Note: The spicy paste can be made in advance. Before serving the hot pot, combine the spicy paste with base stock and bring to boil. Add additional ginger, dried chili, and salt to taste. Arrange the lamb, prawns, tofu, mushrooms etc. on separate plates. Transfer the stock and spicy paste mixture to the stainless steel container on the table top burner and place it in the center of the table. Let guests help themselves and cook the ingredients in the spicy broth. Serve with the dipping sauces (Hoisin sauce, Soy sauce, Sesame butter etc. ).